Objective General English for Competitive Examination - Jagran Josh. General English Book Prepared for competitive Exams only. 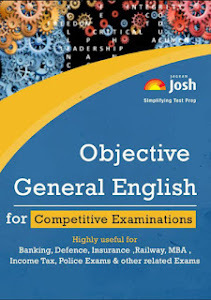 Objective General English for Competitive Examination - Jagran Josh, is a book prepared by Jagran Team for Compititive exams in which English Subject is included. This Book cover all basic English Concepts. Candidate can Download this PDF from the Link Given Below.